Make your recipes more fabulous, just add bubbles. To ease the pain of summer and long days at the beach ending, I comforted myself with autumn themed Le Creuset accessories. 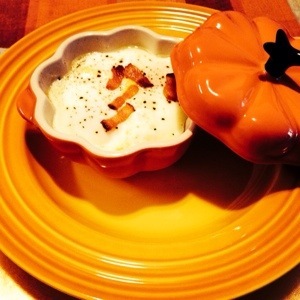 I found this fabulous small pumpkin cocotte that has brought me an unhealthy amount of joy. 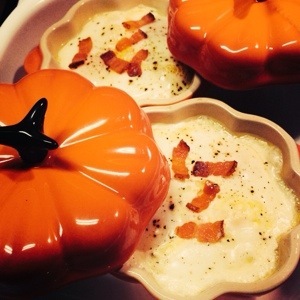 My husband is pretty smart and realized how he could perpetuate that happiness… he bought me a few more pumpkin cocottes. Now he is rewarded by enjoying all the new fabulous things I am making in this super cute stoneware! Please make these eggs en cocotte for brunch someday soon so that you can experience some of this joy. It is extremely simple. 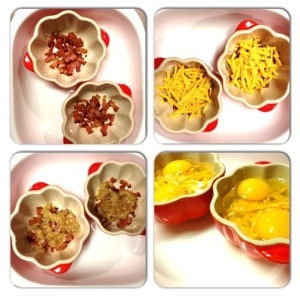 Put some delish ingredients into your small stoneware or ramekins, add eggs, bake. Some other ingredient ideas: asparagus, spinach, potatoes, bell peppers, tomatoes, mushrooms, sausage. You can (and should) use pretty much whatever you have in your kitchen. Depending on the diameter of your ramekins or cocottes, you may need extra egg white to cover the surface. These pumpkins hold 12 oz, they are on the larger side. You can use any size that you have, adjust the ingredients accordingly. If you are using more traditional cocottes, these likely hold 6-8 oz and this recipe will serve 8 people. Caramelizing onions can take some time, but it requires very little of your attention. Let them work there magic on the stove while you work on something else. I am not going to lie, I did not caramelize onions just for this breakfast dish. I caramelized a huge amount of onions in the morning and made french onion soup for a freezer meal. Serve this particular version of eggs en cocotte with Saint Hilaire Cremant. It is my go-to affordable but classic sparkling wine for brunch. Place sliced bacon in medium skillet over medium heat and cook until it is barely crispy, approximately 8 minutes. Add 1 tbsp butter to the skillet. Place sliced onions in the skillet and saute over low-medium heat. Cover with lid and leave them for 15 minutes, do not touch them! 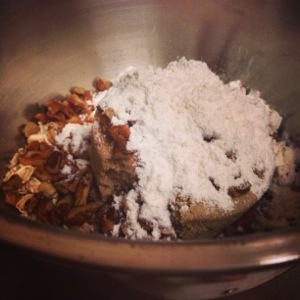 Remove the lid, add the brown sugar and a pinch of salt. Continue to caramelize the onions for 15-20 minutes more until they are brown and taste sweet. Coat the inside of four cocottes or ramekins with butter. Layer the bacon on the bottom. Place caramelized onions over the bacon, sprinkle with cheese. Crack two eggs into each, add extra egg white as needed to form an even layer. Bake for 15-20 minutes until the whites are just set. Serve with toast. This is a Bubbly Kitchen original recipe. 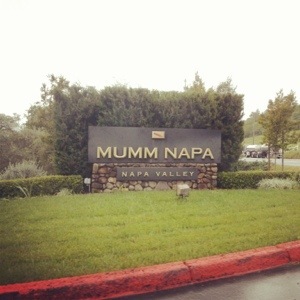 If you visit Napa Valley, you absolutely must visit Mumm Napa. You will learn so much. The tour is phenomenal. The tour guide will teach you all about the traditional method and show you how it works. After that you will relax in a beautiful room, with an amazing view, and an abundance of some of the most delicious wines you will ever drink. (images below.) Although you may not be able to enjoy French champagne regularly, sparklings made via traditional method will bring you very close. 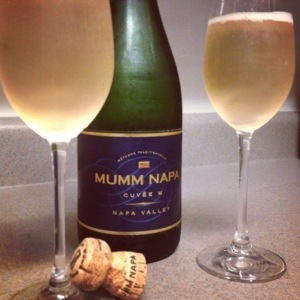 Champagne is always made this way, as are most cavas (sparkling wine from Spain), and most of the Napa Sparklings. When browsing sparkling wine in the store you will often see the phrase “méthode traditionelle” or “méthode champenoise.” This is the process of giving sparkling wine (and this kitchen) it’s bubbles. The fine bubbles of sparkling wine are produced during the secondary fermentation. Secondary fermentation produces the bubbles but sparkling wine undergoes primary fermentation just like any other wine. Primary fermentation is the initial step when the natural sugar from the grapes is converted to alcohol. With the traditional method, this secondary fermentation occurs in the bottle. If the wine is not produced this way, secondary fermentation takes place in large tanks. 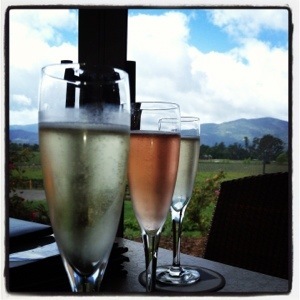 The bubbles produced in the bottle are much finer and the differences is obvious with two glasses of wine side by side. The traditional method entails much more than secondary fermentation in tanks. The cuvée (the wine blend before secondary fermentation) is bottled with a small amount of sugar (liqueur de tirage) and yeast. A temporary cap is placed on the bottles which are then riddled to collect the yeast sediment in the neck. Riddling used to be performed by hand, each bottle was shaken and turned then dropped back in the rack at a steeper angle each day. This is now performed by machines. The temporary cap and sediment are removed during the process of disgorging. Today the sediment in the neck is frozen to prevent loss of much liquid. After disgorging, the dosage is added to the bottle and the cork is placed. The sugars in the dosage balance the acidity of the wine as secondary fermentation consumes most of the sugar. We are having some cold days (as low as 55 degrees!) here in Eastern Carolina which means you will often be looking through enamel glasses into the bubbly kitchen’s cast iron pot. This is a traditional French beef stew made in a daubiere which serves a similar purpose to a dutch oven. It is usually made from inexpensive beef. The tougher cuts will be cooked in the oven for hours making them tender. 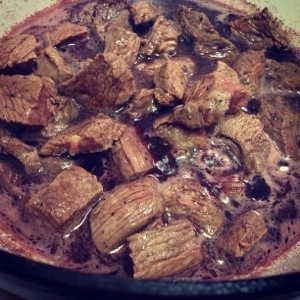 The beef is braised in red wine with vegetables. This stew can be served by itself, with noodles, or over mashed potatoes. This is a fabulous version adapted from cooking light. You can throw these ingredients together in a quick 30 minutes, the stew then cooks in the oven for 2 1/2 hours. So on your next rainy day, I strongly encourage you to put this in the oven and open a bottle of red wine. As far as cooking with wine goes, I do believe in using good wine if you can afford to. 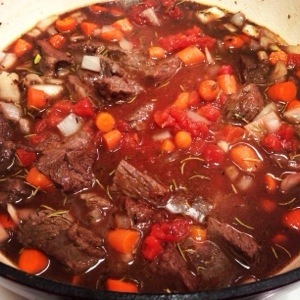 For my Daube Provencal I used a Mondavi Napa Cabernet which is affordable and you wont mind finishing the bottle while the stew is in the oven, the recipe only requires 1 cup. You should pair this stew with an earthy red wine such as a Cabernet Franc. Cab Franc is a blending grape, often in Bordeaux. It is not usually the main grape in a wine, but when it is the forward grape, it is unique and wonderful. Girard makes a fabulous and affordable Cabernet Franc. This is a very spicy and rustic red wine. Many of the wineries in Napa produce pure Cab Francs as special, maybe single vineyard, wines. During my trip to Napa, Cab Franc was by far my husband and I’s favorite atypical wine. Heat the olive oil in a dutch oven over low and add the garlic to the pan. Cook the garlic for 3-5 minutes or until it is fragrant, stirring occasionally. Remove the garlic and set aside. Sprinkle the beef with salt and pepper, be generous. Over medium-high heat, saute the beef for 5 minutes or until browned on all surfaces. Add the red wine and bring to a boil. Scrape up all the brown bits stuck to the pain. Add in the garlic, beef, 1 tsp salt and 1/2 tsp black pepper, carrots, onions, beef both, tomato paste, herbs, and tomatoes. Bring this to a boil. Cover and bake in the oven at 300 degrees for 2 1/2 hours. Remove the bay leaf. Serve over egg noodles or mashed potatoes. This was one of my first dessert creations, many autumns ago. A bite of this reminds me of Kansas City autumn days. You have to stand in the crisp cool breeze of the screen door to cool off from a day of fall baking. It is rough sometimes when the patio door has to be closed to seal in the sounds of my husband’s football frustration. I had not made this in forever and I forgot how simple the recipe is. This will be your go-to fall dessert. 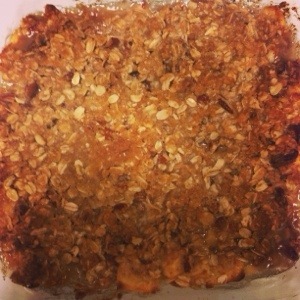 You should serve this apple crisp with a white wine on the sweeter side. If you live in Eastern North Carolina it is definitely still beach season. But you should stop by the Vineyards on the Scuppernong winery. The shop is in a restored 100 year old brick fire station in Columbia, NC on the road to the fabulous beaches of the Outer Banks. The winery shop is wonderful and offers free tastings. Tasting wine is obviously the best way to start your beach day! The scuppernong muscadine grape found along the Scuppernong river is likely America’s oldest cultivated grape, discovered in 1584 by European explorers. 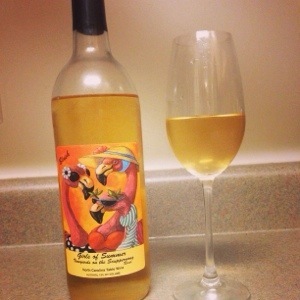 I served my apple crisp with a bottle of Simply Scuppernong, a sweet white wine that has won many awards. Preheat the oven to 400 degrees. Peel, core, cut apples into 1/4 inch thick wedges. Place them into a bowl containing the lemon juice as you cut them, this will prevent them from browning. Add the sugar, cinnamon, and flour to the apples. Toss them till all are evenly coated. Place them in a well buttered 8×8 baking dish. Place the butter pieces, scattered, on the top of the apples. Sprinkle the crisp topping over the fruit. 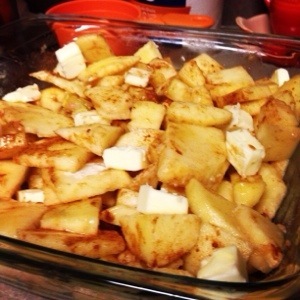 Bake for 40-45 minutes until the topping is golden brown and the apples are bubbling underneath. I don’t know what screams “comfort!” more than chicken pot pie. This soup comes together in no time and has the power to turn around a cold winter day. There are literally only two steps in this recipe. It also freezes beautifully and is easily taken to work for lunch. You will be doubling and tripling this soup recipe after you make it the first time. 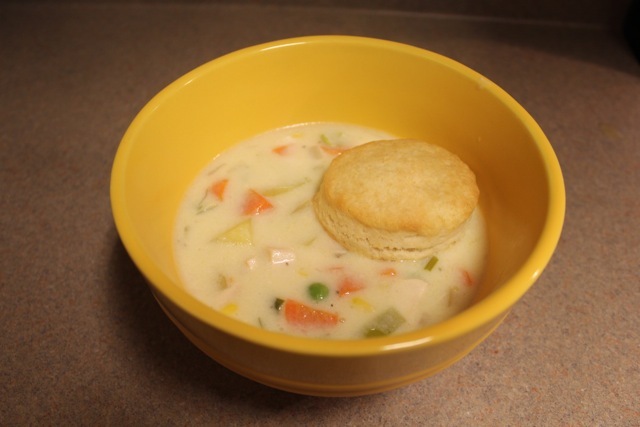 This is a little healthier than the traditional thick and creamy chicken pot pie filling. I calculated this at approximately 350 calories for a generous serving, which is amazing considering how wonderful it is. You can really add whatever kind of dairy you like. If you want it to be even healthier use all skim milk, it may be a bit thinner though. If you want a heartier soup then use all half and half. You could probably use coconut milk or some other non-milk product if you want to be super hipster about it. In a large dutch oven or soup pot, heat olive oil and butter. 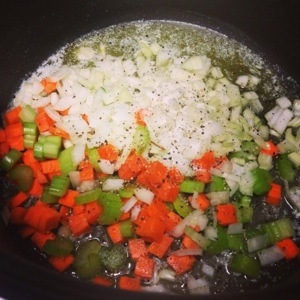 Stir in the onions, carrots, celery, salt and pepper. Cook for 5 minutes, until soft. Add in the garlic and cook for 30 seconds. Add in the flour, stirring to coat all the vegetables. Cook for 3-5 minutes more. It should be slightly golden in color. Mix in the potatoes, chicken stock, and half and half. Allow this to come to a boil. 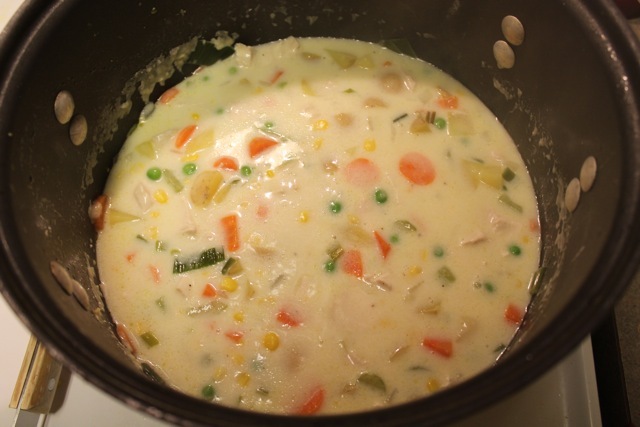 Decrease heat to medium-low, add in the chicken, peas, and corn. Cover with lid, simmer for 10 – 15 minutes more. Add more salt if needed.